The article below was published on the 30th June 2017. I’ve copied it onto the website because I believe it highlights key areas that Retail Traders overlook. In addition, it provides you with key insights into what I do differently. It’s a quiet day here and I’ve got some time on my hands so I thought I’d write something fairly short and hopefully useful. Ok, we should all know the stats regarding retail traders. For those of you who don’t, 90% of retail traders tend to lose 90% of their money in around 90 days. It’s this little fact that got me thinking today with it being month-end and the end of Quarter 2 2017 (Q2 17). 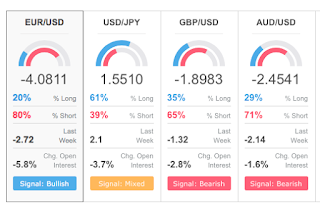 Specifically, I was thinking how many retail traders came to their desks/screens/mobiles today and opened positions who were completely unaware that we were coming into the end of a rather crucial period for the major currencies we follow. To get to the point, I was wondering how many retail traders had no idea about the significance of today’s date, no idea why the currencies had moved to current levels and just looked at their price charts without doing any homework whatsoever and decided their charts look good – time to buy/sell. Let me make this part clear, I’m not having a rant about traders that simply trade using price charts. If that’s what works for you, brilliant! Carry on. What I am making a point about is if you’re struggling to trade off of technical analysis, the likelihood is you’ve been taught backwards. The most important thing on a chart is the price – everything else follows price. Most people we come across have completed education in the past around price action trading, they are very knowledgeable when it comes to support/resistance and price action signals (pin bar reversals, pin bars, bullish engulfing bars etc). However, very few have knowledge about what drives the price – that’s what we focus on first here. In my opinion, you need to have a strong understanding of exactly what’s going on in the world when you’re looking for trades. You need to know why the price is where it is, what’s changed that made it move to where it is and what is the future prospect of it staying where it is. If you don’t know any of these elements, you should not be trading the asset. Look at the daily chart of the NZDUSD. Notice the “pin bar reversal” at a “prior resistance point” from the closing price resistance circa Feb 17. I wondered how many retail traders took this signal and shorted the market – it’s pretty clear they would have been sucked in because the low of the signal day was 0.7265 and the next day tested 0.7253. Furthermore, look at how price has continued its rally during the fake break tagging retail trader’s stop losses along the way (that’s probably why the price has continued moving higher). I thought, how many retail traders knew that the NZD was being pushed higher on commodity currency strength due to the weaker USD, how many retail traders considered that when we heard from the Reserve Bank of New Zealand (RBNZ) on the 21st June 17 their outlook was balanced and domestically positive, how many retail traders knew that New Zealand’s interest rate sits unchanged at 1.75%, which is rather high comparative to the other major areas and the NZD would benefit from carry trade flows heading into the end of Q2. I’ll never know the answer to that, but I do know that it kept me away from even considering selling the NZDUSD. To reiterate, I’m not stating that price action trading is completely the incorrect way to do this. It’s not. I use that to time my entries and exits. What I am stressing is that you need a reason and just because there’s a lovely pin bar reversal at what could be a resistance point is lazy and just not good enough. You should know that when the NZDUSD was previously up at these levels, the RBNZ stated that the currency price was too high – that’s what caused us to trend lower. I personally would wait for either the data to slow or for the RBNZ to clearly state that things have gone a little adrift before selling. It’s the daily chart of the EURUSD. Look at the “price action reversal signal” seen on the 14th June 17 (Federal Reserve Rate Decision). It’s obvious retail traders got sucked into this one…that’s one of the reasons prices ran so quickly through the 1.12 handle on the 27th June 17 when ECB President Draghi reiterated a more positve stance to reducing monetary policy later down the line – that’s price steaming through stop losses. Again, I’ll never know the answer to how many got sucked in, but I wonder how many retail traders knew how bad the US data was for Q1 17, how the ECB had already mentioned that their monetary policy stance could change over 2 months ago and that even when they lowered their inflation forecasts for the years ahead, the EUR did not want to move lower. The EUR was at best levels for the year for a reason and a pin bar reversal is not going to change that. Granted, the price did run circa 55 points until it found support at the monthly pivot (I mentioned that to our clients as a base), but 55 points when you’re trading the EURUSD daily chart as a retail trader (considering your stop is behind the high of over 90 points +) is not good enough. So my guess is that traders sat in these positions hoping that the market was going to sell off and got flushed out when it went the other way. Ah, they are. The images above are retail sentiment indicators provided by IG and Oanda. 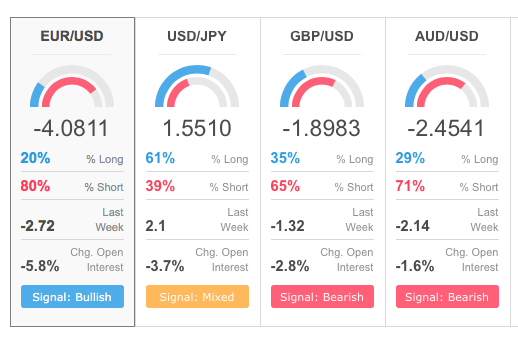 You can clearly see that 80% of retail traders are short the best performer on the year (IG) and 76%+ are short the NZD (Oanda). The likelihood of price pulling back at these levels is high, that’s fair enough. But the probability of price rallying higher next week is a little higher if you ask me. I think it’s because it’s easy money to squeeze retail traders as the price pushes higher and higher against them. I’m not averse to the mean reversion idea, but I think you need a reason why you think it’s going to drift lower. Hopefully, it surprises you that I focus heavily on fundamentals/sentiment before looking at the price charts. I personally believe it’s crucial – especially for day trading. I suppose the long and short of it is; do your homework on what you’re thinking about trading, consider where it is and why it’s there before you click the button.